UC Santa Cruz strives to create an environment in which all students can succeed. 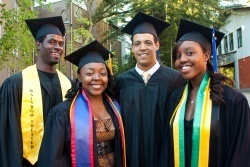 We are committed to helping all students graduate, graduate in good time, and thrive academically. We are also committed to enrolling and nurturing students who reflect the full diversity of California as part of our campus commitment to equity and excellence. We are proud to be an Hispanic Serving Institution, to be ranked 24th in the world on CollegeNet's 2017 Social Mobility Index, and to be the #1 college for Latina/o students according to BestColleges.com. UC Santa Cruz was featured in the Social Mobility Through Higher Education e-book, with an article by Vice Provost Jaye Padgett. The Division of Student Success provides campus-wide coordination and leadership for student success programs and activities across departments, divisions, the colleges, and administrative units. We support initiatives across the campus. We also do our work through a range of resource centers dedicated to providing direct student support. In addition, the Division of Student Success includes the Student Success Evaluation & Research Center (SSERC), an innovative center that engages in collaborative research with faculty, students, and staff to better understand, assess, and support student success at UC Santa Cruz. SSERC provides data, research, and evaluation support to the UC Santa Cruz campus. The Division of Student Success’ work is informed by the Student Success Steering Committee (SSSC), with membership from campus leadership, faculty, students and staff from across the campus, reflecting the broad campus commitment to ensuring student success.